MaxAgreement is a Contract Lifecycle Management (CLM) solution that helps you track the life of your contracts and/or agreements with vendors, clients, partners and other parties, from start to finish. 1. Easily track the status of all your active contracts and agreements at a glance. 2. Empower the other party to the agreement with their own copy of the agreement. 3. 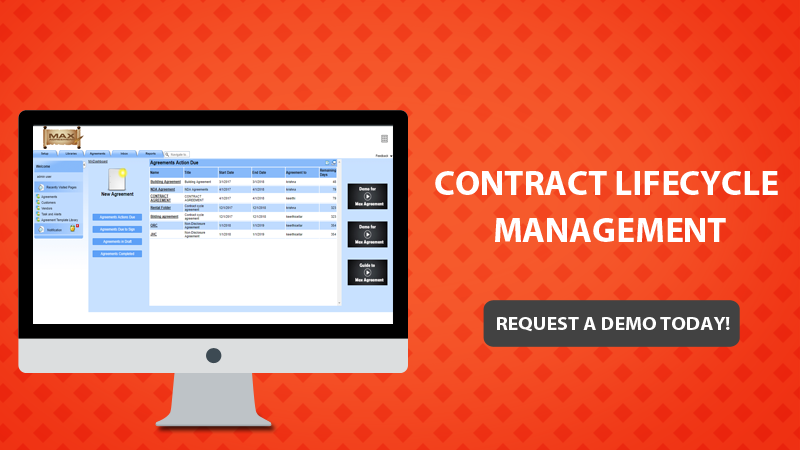 Manage all your contracts and agreements in one place. 4. Store all your contract and agreement templates in one place, for ease of use when you need to create a new one. 1. Full Clause Control. MaxAgreement gives you the ability to view each of the clauses in your contracts separately, allowing you to ensure the accuracy of each one and helps mitigate legal risks. It helps make sure you're not missing any important clauses. An overlooked or missing clause is a financial risk because signed contracts are binding and some of them last for years. 2. Version Control. MaxAgreement's interface gives you a historical view of the contract or agreement's lifecycle. This benefits your company because it provides easy access to information in case it is ever needed for legal purposes in the future. 3. Agreement Library. This feature allows MaxAgreement users to produce consistently clear contracts that are of high quality and are legally enforceable. 4. Cost-Effective. Because MaxAgreement provides you with a dashboard that gives you an overview of all your active contracts, you wouldn't have to worry about the cost for non-compliance on any of your contracts. 5. Reduced Administrative Cost & Effort. MaxAgreement helps your contract administrators by eliminating the time consuming task of manually maintaining your contracts and agreements in a spreadsheet. It frees them up to work on value-add tasks that can benefit your business more. 6. Streamlined Contract LifeCycle Management. A contract administrator's job can easily be classified as challenging but since MaxAgreement is a cloud-based application, it allows the company to easily manage contracts and agreements. Because of the streamlined process, it is also easier to track when agreements are about to end. This gives you the opportunity to offer renewal perks to clients, and helps maintain valuable partnerships. 7. Risk Avoidance. Avoid litigation from contract non-compliance or not monitoring the changes in terms or contract rates.